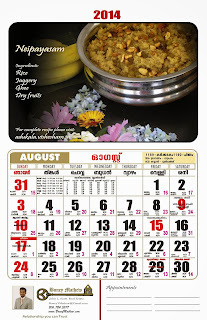 Khichdi in hindi means hotchpotch, which is like a stew with lot of ingredients cooked in one big pot. 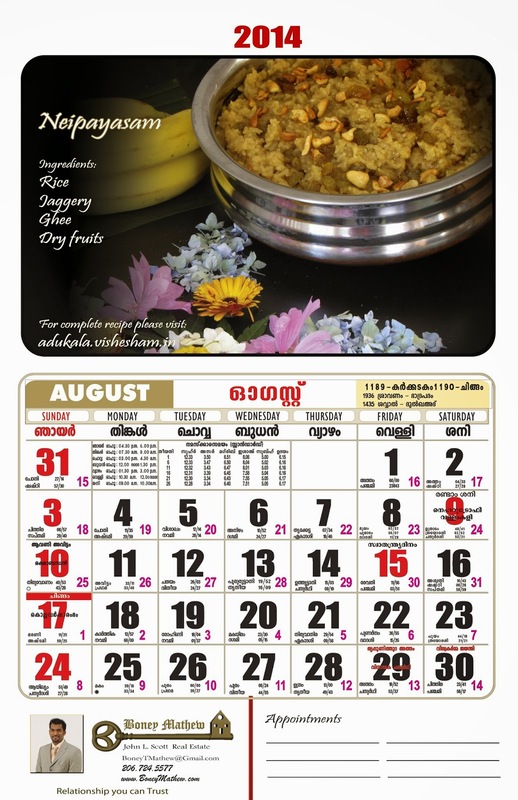 There are many variations to the Indian khichdi. Here is our take on this wholesome meal with rice, lentils and vegetables that is perfect for the whole family. Also this is a great choice for babies about 8 months and older because it's mushy and easy to digest. Heat some oil/ghee in a pressure cooker. Add the jeera, ginger, garlic, onions and saute. Add turmeric, salt, chopped vegetables and saute again for 2-3 mins. Add the moong dal and rice and stir for another minute before adding the water. Adjust the salt. Pressure cook for 2 whistles. For babies you can over cook for about 3-4 whistles and mush it up with a spoon. Serve hot with ghee or even mix it up with yogurt. Salmon is abundant here in the Pacific Northwest and is a highly popular fish. It is full of omega-3 fatty acids which is known to improve heart health. We have attempted to make it to suit our spicy Indian palates. Absolutely healthy and delicious this dish makes a great appetizer or a side. * You can use the fresh or frozen fillets. We used the frozen salmon fillets from costco. 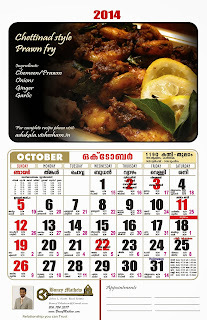 * You could also use any fish curry masala which is one step easier to make the marinade. * You can instead add 1 1/2 tablespoons of the fish masala, salt, pepper, olive oil, lemon juice and curry leaves. * The oil in the marinade is key to getting a moist fish when baking else it will get very dry and rubbery. Mix all the dry powders. Add the olive oil and lemon juice. Tear in the curry leaves. Make a smooth paste and rub it all over the fish cubes. It's best if you can marinate for more than 24 hours. Pre heat the oven to 500 F.
Take an oven proof flat baking tray or a pizza plate. Cover it in aluminium foil. Spray some cooking oil or rub some oil before you put the fish else it might stick to the aluminium foil. Put the marinated fish cubes and bake for about 15 - 20 mins when it almost starts to brown, broil it on high for 2-3 mins and turn off the oven. It might take longer, keep a check on the fish while it bakes. Serve hot. Squeeze some more lemon if you like. This is a quick fix meal with a few basic ingredients we usually have in the fridge. Interestingly this combination of Spinach and Cabbage is really good and is a great way for kids to eat some greens and protein all in one meal. Heat oil in a wok or a deep heavy bottom dish. On medium to high flame add the chopped onions, ginger, garlic, green chilies and saute. Make sure you keep sauteing else it will burn. Add the cabbage and spinach and saute. Add salt and pepper to taste. Add the cooked rice and mix well. Scramble the egg in a different pan with some salt and pepper. Mix into the rice and serve hot. Superbowl is only a day away and this year the excitement has been crazy since our home team the Seattle Seahawks is playing. Go Hawks!!! To make it more fun this super bowl party, we decided to try Nachos. Its like chips and dip all together in one big dish. What more do you need than Chips, cheese and some heat to watch the big game. For those who want a non-veg appetizer you could give this super easy chicken wings recipe a try. *We used homemade Guacamole, for the recipe click here. In a flat bottom oven safe dish spread a layer of tortilla chips. Sprinkle a layer of cheese on top of it. Meanwhile heat the beans for two minutes in the microwave. Preheat the oven for 375 F. Once the oven is ready bake for 5-7 minutes or until the cheese melts slightly. Spread the beans on top it. Add the rest of the chips. Spread a layer of chunky salsa, olives, jalapenos. Drizzle the cheesy sauce and bake again for 5 mins. Take it out and add the guacamole and sour cream. Garnish with the scallions if you like. Serve hot and we bet it will vanish off in minutes. Guacamole is a great Mexican dip that is made of avocados. Avocado on its own is very plain tasting but jumps to life mixed with these spices. Serve them with tortilla chips and we bet you wont stop the munching. * The trick with good guacamole is getting a good avocado. You should press and check to see if its slightly ripe. Overripe ones when you open are more brown than green. The key is to find the flesh all green and soft. Finely chop the onions, garlic and green chilies. We usually do it in the food chopper on one single run. Cut the avocado and deseed it. Scoop the flesh out and run it in the mixer just once to get it all smooth. You could even mix it with a spoon and add it to the chopped onions, garlic and green chilies. Finally add the salt and lemon juice to your taste. You could even add some chopped fresh cilantro leaves if you like. The dip is ready to be served. Wishing all our dear readers abundance of happiness and prosperity on this Pongal. 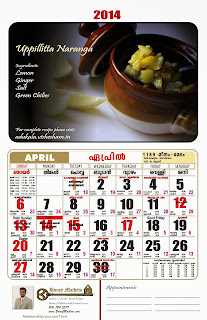 Pongal is a harvest festival mainly celebrated by the people of Tamil Nadu. 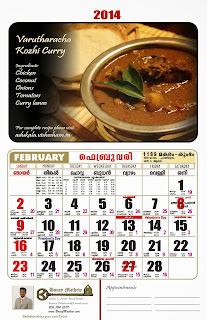 It also coincides with MakaraShankaranthi which is also the harvest festival for many other states. 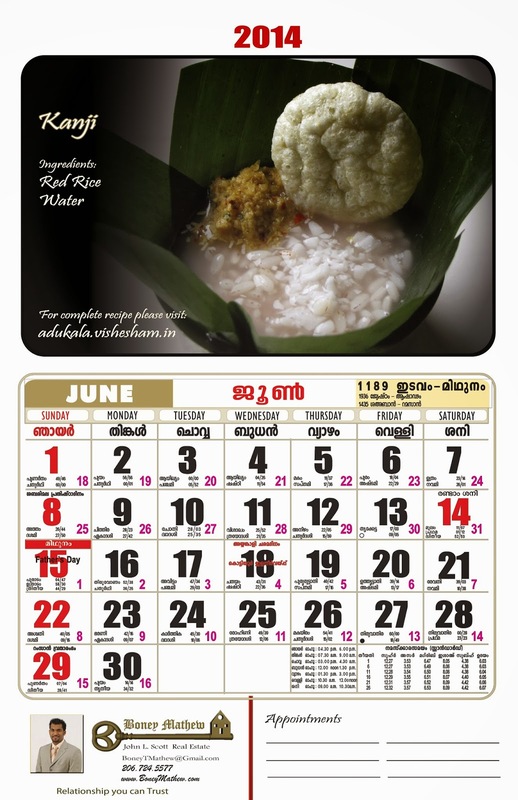 On this special day they make the two versions of this rice and lentil dish, one sweet and one spicy i.e, Sharkara Pongal and Khara pongal. Heat some ghee in a pressure cooker. Add jeera, black peppercorns and the grated ginger and saute. Add the moong dal and saute for a minute. Add the rice. Put the turmeric powder and saute for 5 mins. Add 3 cups of water. Put salt to taste. Stir and cover and cook for about 3-4 whistles. Turn off the heat. Open and check to see if its all cooked and should look little mushy. If you think its still thick and lumpy. Boil some water and add it little by little while continuously stirring. Heat little more ghee and fry some cashews and add on the top. 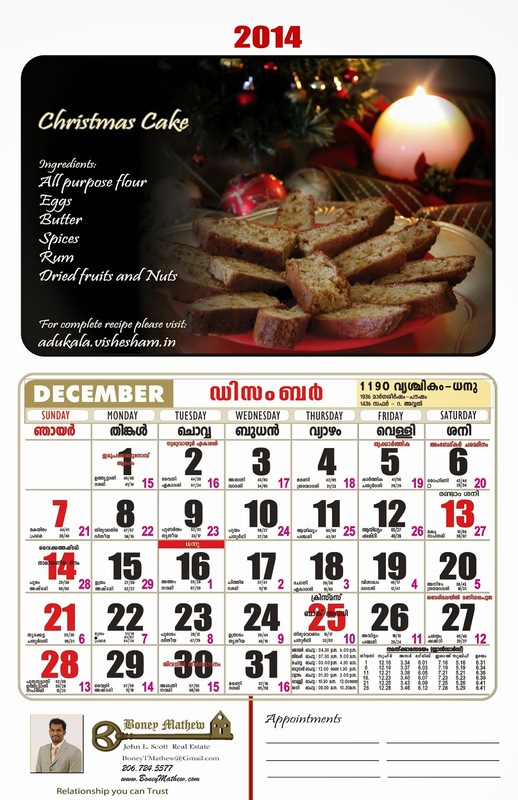 Serve hot plain or along with some steaming sambhar. * You can fully cook it in low fat milk or do half - half ratio of milk and water. Lightly toast the moong dal in a pressure cooker without any ghee. Add the rice. Pour the milk and water and pressure cook for 3 -4 whistles until fully soft and cooked. Melt jaggery with 2-3 tablespoons water until syrupy. Open the pressure cooker and add in the melted jaggery and stir well and let it thicken on low heat. Add the ghee and cardamom powder. Stir well. Turn off the heat. Fry some raisins and cashews in one tablespoon of ghee and garnish. 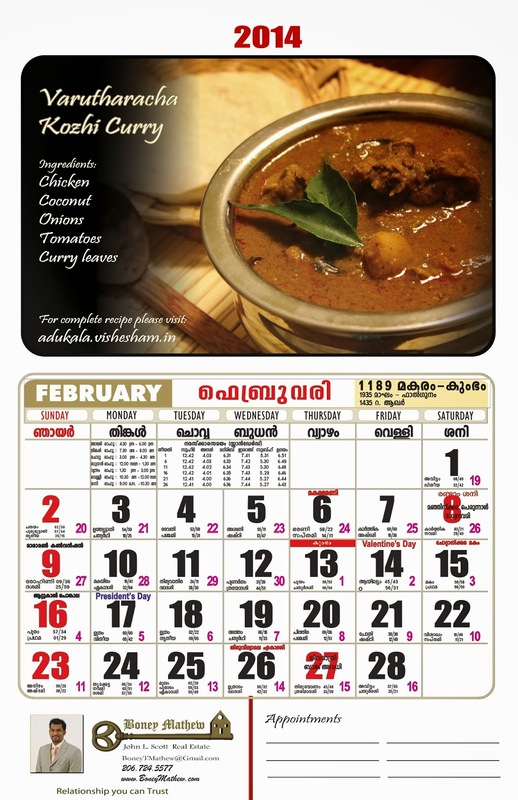 We are so delighted to share with our dear readers that our recipes and photos have been featured in the annual Malayalam calendar created and sponsored by Boney Mathew, a friend and a realtor who has been a favorite in the Malayalee community in Seattle. Thank you very much once again Boney Mathew. For detailed recipes please use the links below. 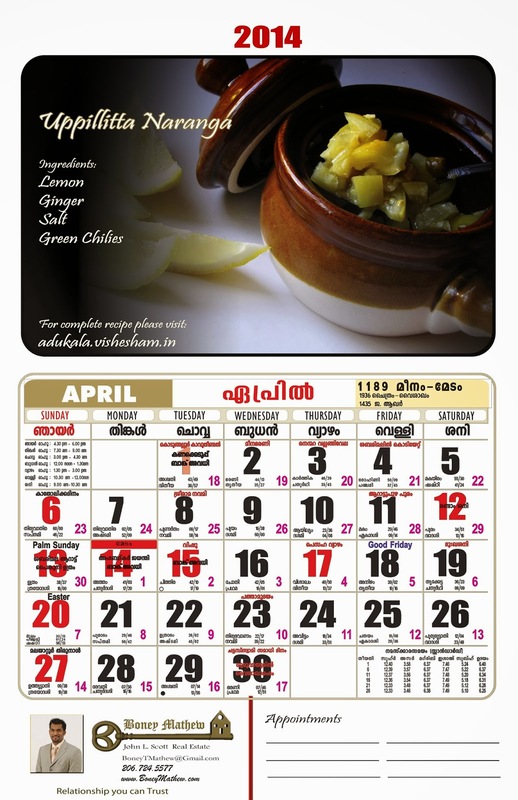 Uppiliitta Naranga which literally means salted lemon is a very delicious pickle. It is simplicity at its best. Usually this is served with Kanji (Rice Porridge) or plain curd rice to awaken your dead taste buds either during nausea or just any flu. The longer it stays the better it tastes. Chop the lemons into small pieces. Add the chopped ginger, green chilies and garlic. Add the salt and lemon juice. Mix everything really well and store it in a air tight container. Let it sit outside for 2 days. Keep it refrigerated at least one week before you use it. The lemon will become nice and soft, soaked in all the juice and spices. Like wine, older it gets better it tastes. Wishing all our dear readers a very happy, peaceful and prosperous New Year. New resolutions are always talked about during New years. One of ours is to include more healthy choices in the diet. Quinoa is a high protein low gluten grain that is very popular these days. So here's our first recipe with this power packed grain. * We have used some chopped cabbage, carrots, broccoli, bell peppers, corn, edamame beans and peas. Boil the quinoa in water with a pinch of salt. Boil for about 15 mins until you can almost start to see little threads that looks like a sprout to the seed. You can do a taste check and see if it has become soft. If you have extra water, drain it off. Keep the cooked quinoa aside. Heat oil in a deep wide-mouth pan or even a wok. On medium to high flame saute the onion, ginger, garlic and green chillies. Add the chopped veggies and stir fry continuously on high flame. This is done to retain its crispness. But make sure you dont get it all burnt. Add the vinegar, chilli garlic sauce and pepper. Toss in the drained quinoa and saute for another minute. Turn off the heat. We have given a vegetarian low calorie version, however you could add some cooked chicken or scrambled egg to make it more interesting. 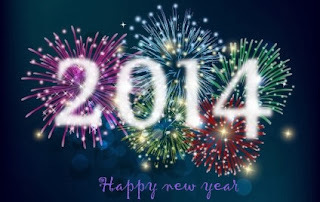 Once again we wish all our readers happy new year.